Server costs for the next year... covered! An additional testing and emergency backup server added. All developer and certificate fees for the next year paid for. A 'tall skinny' Android phone added to the device testing pool. (An Honor 7X. Would have loved a Pixel 2 for crazy skinny-ness for testing, and power for use... but $600-$900 is just crazy for a phone, and I think there are wiser uses for the funds). A powerful refurbished Macbook Pro added as a backup Apple publishing device and mobile developing platform! Established a device repair pool for the iMac purchased last year. A second monitor added to the iMac to streamline development. Once all the planned purchases are covered, a small percentage of the proceeds will be added to a fund I'm building so that my son and I can hopefully meet many of you at GenCon 2020! The list of winners and rewards have been posted to the Purple Sorcerer Blog! Most of you should have received your free adventures. If you donated between $10 and $35 and didn't specify which adventure you prefered, you should have received a follow up email asking for your choice. (If you haven't responded, I'll send out your code as soon as I receive your preference!) Everyone who let me know their choice, or who donated $35 or more should have received your RPGNow codes. If you haven't, first check your spam folder, then contact me at info (at) purplesorcerer.com if you don't see them! Below you can read the information from when the drive was live! I’m thrilled that so many judges and players in the DCC community continue to find great value in our free tools. Whether it's our character generators (nearly 10,000,000 peasants created! ), The Crawler's Companion dice-rolling and reference app, our custom spellbook utility, or one of the easy to use demon, dragon, or magic sword generators, each tool has been built with the simple purpose of making it easier for everyone to enjoy the Dungeon Crawl Classics Role-Playing Game! Our tools are free, and will always be free. But there are a number of expenses associated with creating, maintaining, testing, publishing, and hosting the free tools, including server costs, development fees, the need for new hardware, mobile devices for app testing, and various software expenses. These would be challenging for me to cover, but the incredible generosity that the DCC community demonstrates during our annual drives continues to meet all these needs, and more! If you're going to receive a Special Treasure for being a top donor, I'll contact you requesting your list of top choices, as well as your address for mailing physical items. Unless otherwise noted, many physical treasures are only available to pledgees in the United States, unless we work out special arrangements. Thanks to all of you who continue to support the free tools! In addition to the amazingly generous folks who give to the drive, there are others in the community who provide stunning, often unique prizes. Many items in this pool of goodies are distributed randomly to lucky winners who donates $10 or more. 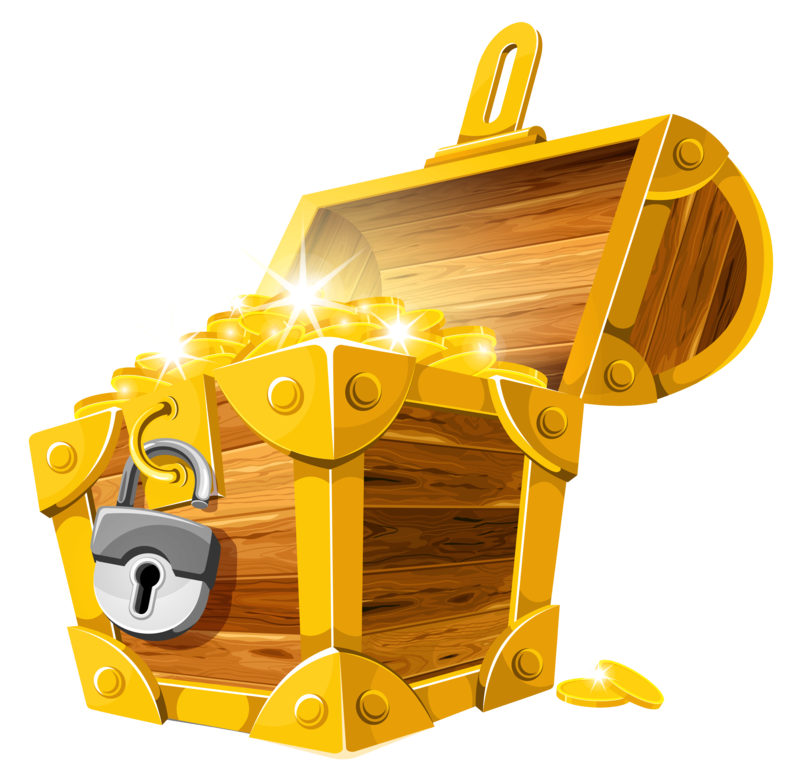 There are also special treasures that can be claimed by those who are especially generous. (The most generous backer has first choice in this pool, and so on). 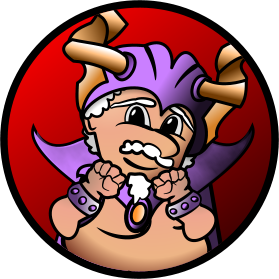 Those who give $35 or more will also be enshrined on the Purple Sorcerer Patrons page! Every year I’m stunned by the generosity of everyone involved. If you’d like to get in on the fun by donating something to the prize pool, just let me know as soon as possible! The drive ends on June 30th, at which time the random prizes will be determined, and I'll begin contacting the most generous donors. New! 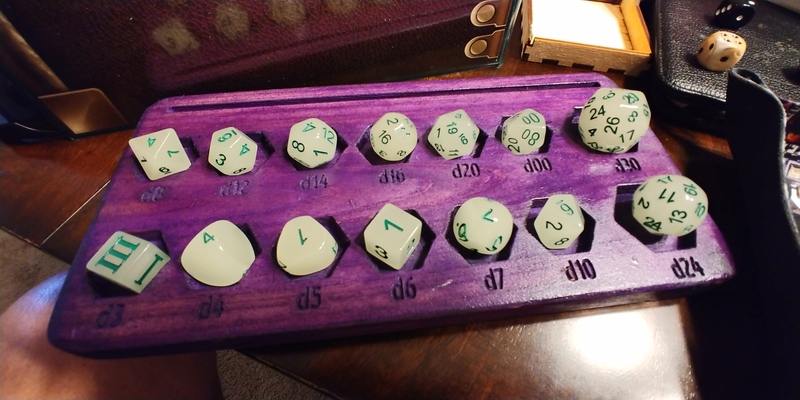 The rider of dark trails, David Baity has added a unique wooden holder for your funky dice built by Ken Campbell! Show off your favorite bones in style. New! The mutantous master, Jim Wampler, has added both a signed Mutant Crawl Classics Rulebook and a set of circa 1978 Gamma World minis he had recast from the originals by Iron Wind Metals! A Dungeon Crawl Classics or a Mutant Crawl Classics rulebook provided by the Dark Master himself, Joseph Goodman from Goodman Games! 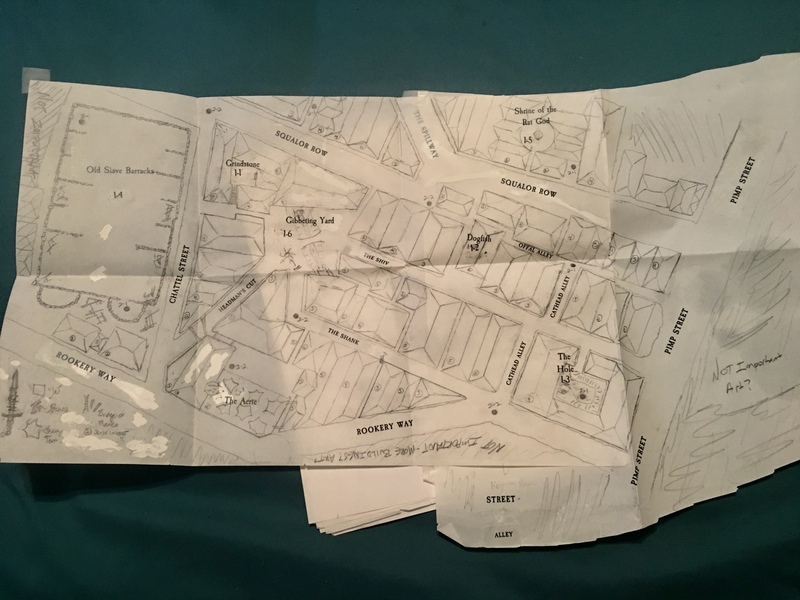 An amazing collection of hand-drawn pre-production maps created by the one and only Harley Stroh for an upcoming Lankhmar adventure! “Death Lies in the Balance: The Documented Evolution of a 2017 Gen Con DCC Tournament Encounter”: A collection of notes and drawings from resident brainiac Terry Olson detailing his process of creating an elaborate encounter for the Goodman Games Gen Con tourney: a unique treasure for any writer or adventure designer! An incredible wooden book from Ken Campbell. 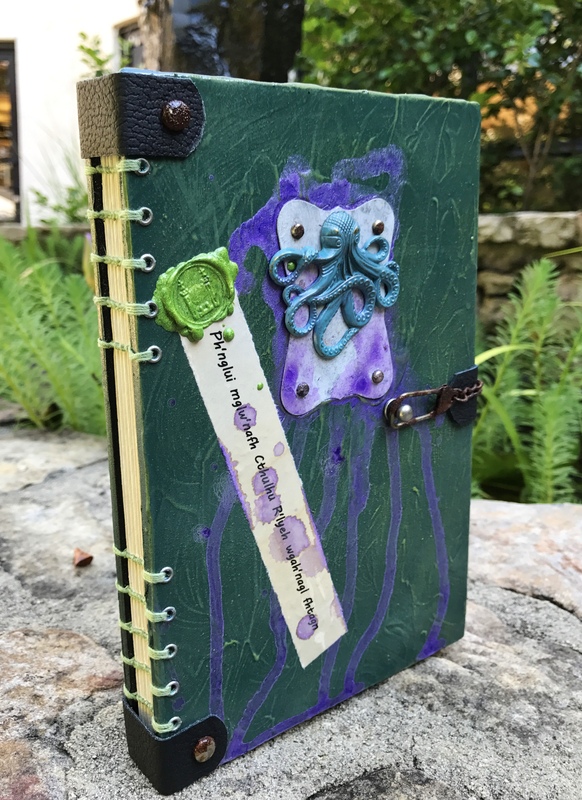 We were all blown away by Ken’s efforts last year, and this year he will be providing a Cthulu-themed notebook! The rarest of t-shirts (XL size), created for the UK Games Expo by Bruce Cunnington: one of only 15 such shirts in existence! It goes without saying that being part of Bruce's select posse is worth any price, right? Right?!? 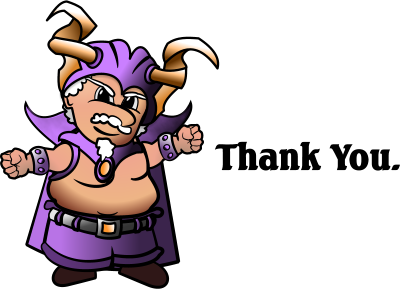 Purple Sorcerer Games Purple Tickets: With the Purple Ticket you receive PDF copies of all past and future Purple Sorcerer Adventures for as long as we’re kicking! (Including early-release PDF's unavailable to the general public and at-cost print versions). Though the Sorcerer was lame in the last year producing new adventures, there are MANY in the pipeline that will be arriving in the next year and beyond! Be in the running to win either a DCC or MCC rulebook provided by the Dark Master himself! Woot! Be in the running to win a Purple Ticket! Daily Winners: Each night during the drive I'll randomly choose one lucky winner who donated $10 or more that day to win a featured Purple Sorcerer adventure for themselves or a friend! 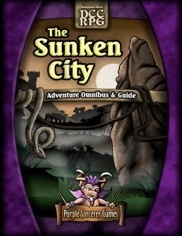 The featured adventure for the final of the drive is The Sunken City Omnibus! One lucky donor will receive a Purple Ticket! Five random supporters will receive the entire current lineup of Purple Sorcerer adventure PDFs! New! The appendix-N loremasters at Sanctum Secorum have added their 2017 and 2018 Free RPG Companions to the pool! New! R.S. Tilton has added issues 1-3 of his super-cool Meanderings Zine! New! Artist Frank Turfler has added Battle Map Image Sets for Nebin Pendlebrook's Perilous Pantry, and The Frost Fang Expedition! 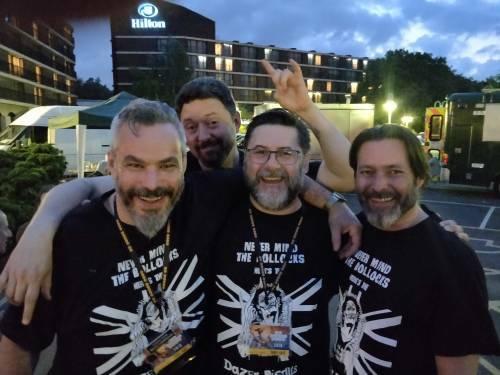 For European supporters, the coolest dude in DCC, Jurgen Mayer (and his friends at Ultra-Comix Nürnberg: https://ultra-comix.de) are providing print copies of the new Goodman Games DCC Quick Start Rules, and DCC #71: The 13th Skull! The inimitable Dak Ultimak is providing Crawl! Zines to a number of lucky winners! Mark Gedak, the driving force behind our purple brethren, Purple Duck Games, is providing PDF copies of: CE 9 - Both Foul and Deep, FT 1 - Creeping Beauties of the Wood, and Races of Porphyra: Ith'n Ya'roo! The Thick-Skulled and snake-like eldritch master Stephen Newton is contributing print copies of Children of the Fallen Sun, Attack of the Frawgs, and Stronghold of the Wood Giant Shaman! The mystical spaniard Jose Sanchez from Other Selves Publishers is providing print + PDF copies of The Phlogiston Books Volume II to five lucky winners! The man with the coolest name in DCC, Marzio Muscedere, is contributing PDF copies of Death Slaves of Eternity and Steel & Fury! Done! Covering the yearly server costs for the two Purple Sorcerer servers (main and data). Done! Adding an additional testing server, since the previous testing server is now the data server that facilitates data sharing in the Crawler's Companion. Done! With the addition of the expensive new iMac comes a somewhat gnawing fear of how I will be able afford to pay for equally expensive Apple service if (heaven forbid) something goes seriously wrong with the new machine. (Especially since I now perform my day-job work on it as well). So a portion of the funds raised will go into a repair expense reserve pool to cover potential repair costs, etc. This will actually be a fairly big deal from a 'be able to sleep at night' perspective for the Sorcerer, who is used to building his own computers where he can replace parts inexpensively with relative ease. Done! Cover the purchase of at least two new mobile devices for testing, likely including a tall, skinny device running the latest version of Android. (Because of the idiosyncrasies of the iPhone X, it would make sense from a testing standpoint to have one, but there is no way on earth I’m blowing $1000 of the community’s generosity on one of them!) If we do extremely well, extra niche devices are always an option. Done! Picking up a few animation tools I've had my eye on that will make certain interactive things possible for potential html5 and web-based tools. If we are particularly successful with the drive, I’ll consider purchasing a signing certificate, so that the desktop versions of the Crawler’s Companion and Multi-tool will be able to be installed without all the warnings associated with unsigned apps. I’m fairly reluctant to do this, since it would add a fairly costly re-occurring annual expense, but it would be a boon for desktop users of the Crawler. And finally, if things go really well, I’ll place some funds in my GenCon 2020 fund. That’s right, the Sorcerer might finally make an appearance at an event so I can meet many of you in person! I know this is stretching the concept of supporting the tools, but I hope you grant me this indulgence. When my son returns from his church service in 2020, we’ll have about 6-8 months together before he takes off to finish college and beyond. We’ve talked about going to GenCon in brightly colored Purple Sorcerer shirts since he was a little guy, and this would basically be our last chance to make that happen. I’m somewhat embarrassed to admit I’ve never actually been to a con, but now that my health is improving, I’m actually excited about the possibility. I hope to be able to put enough away over the next few years to make the trip a reality! New! Since I've heard from so many of you that you'd love to see additional Mutant Crawl Classics tools, I've offically added the MCC Upper Level Character Generator to this year's list! Officially adding Portuguese, German, and Spanish labeling to the 0-level generator. (French will likely be added as well). Integrating the functionality of the Sorcerer’s Grimoire into the Upper-Level Character Generator, so that you can optionally print out a custom spellbook with each upper-level spellcaster! Finally, I'd like to continue to explore the feasibility of converting the Crawler and Mutanteer’s Multitool to HTML5 apps accessible from any web browser. When the Multi-tool is complete I will be publishing 8 different builds of it, and 8 of the Crawler, with each new update! Publishing to the various stores is one of the most time-consuming, and often frustrating, aspects of providing the free tools. The incredible support of the DCC community makes this all possible. Thanks to each and every one of you who supports the free Purple Sorcerer Games tools! It's always a thrill to see the tools in action. I've whipped together a quick slideshow of images recently posted to the Facebook and Google+ DCC Groups, showing off the tools being used during Free RPG Day sessions and at Origins 2018! (Since these were posted publicly, I'm assuming it's OK to include them here.